Perdido Sun is your place in the sun. From your own private, beach-front balcony you can enjoy spectacular beach views of the clear emerald waters and dazzling white sand. This 6th floor unit is beautifully furnished with Ceramic tile in Living Room, Dining Room, Kitchen, Baths and carpeted Bedroom. Electronics include 46” Flat screen TV, DVD, CD Player, Stereo in Living Room and 24” TV, DVD in Bedroom. Your team is very friendly, helpful and very knowledgeable about the area. Scheduling our visit was so simple and amazingly affordable. We arrived in area ahead of schedule and your team was so nice and allowed us to check in early. We found the condo complex with ease, but when we walked in to get our parking pass, there was a note that the receptionist was out to lunch. I found it strange that they did not have someone to cover. We found a place near by to have lunch and returned later. The team at Perdido Realty is excellent! We enjoyed our condo and our time at Perdido Key. We had stayed at Perdido Sun before and were looking at that condo in particular. As for the staff, they were excellent and things could not have gone more smoothly. Your communication both on the phone and with emails is excellent and very much appreciated. 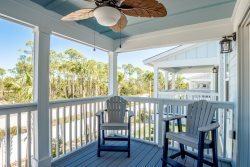 We love Perdido Sun, the property and the location.